Story: A storm has swept over a tropical island, washing away the dodo eggs and infesting the place with monsters. You must guide the eggs back to safety. 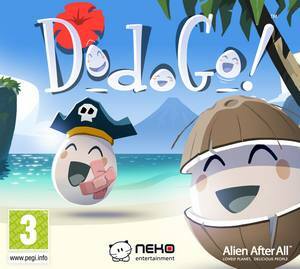 Gameplay: DodoGo! is a 2D puzzle game in the style of Lemmings and Mario vs Donkey Kong: March of the Minis. 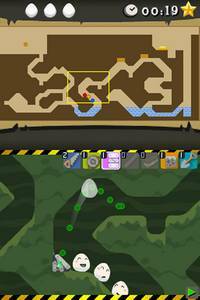 Each level requires you to get one or more eggs back to a nest as quickly as possible, using a selection of tools to circumvent obstacles and traps. Direct control over the eggs is restricted to making them go left, right or stop. You start with a few planks to break falls and span pits but gradually move on to employ an assortment of items including springs, fans, blocks, ropes and exploding robots. These combine with stuff already in the levels, such as fires and creatures, to produce some fiendish escape routes. Getting all the eggs to the nest earns a medal for the level. Ensuring they're happy and uncracked leads to better medals, as does beating a time limit, but a restricted supply of equipment in each level means things soon become tricky. Bonus levels work more like a Tom & Jerry style mousetrap. There's no time limit but there's also no interaction allowed once the single egg is set in motion. Everything must be arranged to guide the egg around automatically, collecting tokens as it goes. Completing bonus levels unlocks new egg costumes and jokers which allow hard levels to be skipped. Save System: Automatic save after every level. Sadly, however, there are only two save game slots. If you have more than two people wanting to save their progress on the same DSi, you're going to have to keep copying the game backwards and forwards between the system memory and SD cards (with all the associated hassle and risk that that entails). This is plain daft. Comments: Starting up a level near the end of DodoGo! is like knocking over a child's LEGO creation with the hoover. You just kind of stare in horror, swearing under your breath, wondering where on Earth to begin piecing stuff back together. Then, after a little thought and experimentation, things start to click into place. A plan forms. Eventually, through a combination of perseverance, luck, skill and pure genius, everything slots home. There's satisfaction and relief, your little charges are happy again and there are maybe only a couple of bits left over. Result. Once it gets going, DodoGo! is an excellent puzzle game. Obtaining the highest rank in each level requires plenty of head scratching and precision but never seems impossible. The balance between success and failure is judged perfectly to make playing a compulsive experience. The bonus levels also help to vary the pace nicely. Unfortunately, the first hour isn't quite as much fun. The initial stages are full of laborious tutorials. The touch controls, meanwhile, are slightly finicky, meaning some actions can take several tries to register. After a while, however, the tutorials thin out, the selection of tools becomes more interesting and practice helps somewhat with the controls. Nonetheless, the game gets by on cute graphics and the promise of things to come for slightly too long. The game is much more fun in the later stages. The excellent level design comes into its own and smart touches become more obvious, such as the way you're allowed to look at levels for as long as you like before the timer starts. DodoGo! also goes out of its way to cater for those of differing abilities. Only getting a single egg through to the nest allows progress through the game and players have a stock of jokers to allow them to skip really problematic levels. Despite this, children under eight aren't going to get far without lots of help. Nine or ten is probably a more realistic lower age limit for those wanting to get the most out of the game. Adults will find plenty of challenge. Conclusion: Fun, addictive, pretty and makes your head hurt in a good way. Better than a lot of the full-price cartridge games out there. Length: That depends how clever and thorough you are, although getting the top rank on all the levels is bound to take an adult several hours. That said, the game does appear to have been clumsily truncated about halfway through, actively promising much more and then abruptly throwing up a 'Thank you for playing' screen. Expect a sequel soon.